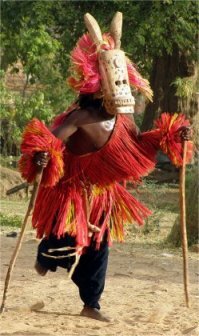 The concepts behind the Dogon religion are related to cosmic events that we are just beginning to understand thanks to the Hubble Space Telescope, NASA (National Aeronautics and Space Administration), JAXA (Japan Aerospace Exploration Agency), ESA (European Space Agency) and other groups. 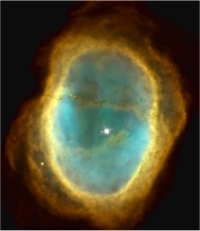 It is because of these groups that information about astronomy and astrophysics has been made available to the public. 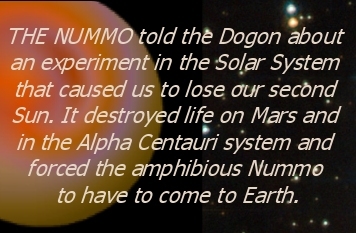 The Nummo taught humanity about astrophysics so that humans wouldn't make the same mistakes they'd made. The Dogon religion refers to an experiment that was carried out on a blackhole that ended up restructuring the Nummos' entire galaxy, destroying life on Mars, in the Alpha Centauri system and elsewhere. It created our planet and caused our Solar System to lose its second Sun. According to the Dogon, the stars were much closer together when these events occurred billions of years ago. Ancient mythologies indicate that there were a group of fifty individuals who may have been inside the wormhole or blackhole when the experiment was carried out. They emerged to find that the entire Milky Way Galaxy and Universe had been restructured. What they learned is that there are fail-safes embedded into the Universe to protect it. They ultimately attributed these fail-safes to a creator entity known in the Dogon religion as Amma. My research reveals that this tragic event is the source of all ancient religions and appears in the guise of stolen fire, stolen fleece and stolen cows, all of which are Sun symbols in the Dogon religion. In Europe, where this religion was practised prior to the Inquisition, the Sun was symbolized by an apple and a rose. My research indicates that a red rose was a symbol of a red giant star that both created and regenerated the world. A red giant star exploding as a supernova to regenerate the world is represented in the rose windows of ancient churches including this image from Notre Dame Cathedral in Paris. This window was created by Jean de Chelles, who began it in around 1250. 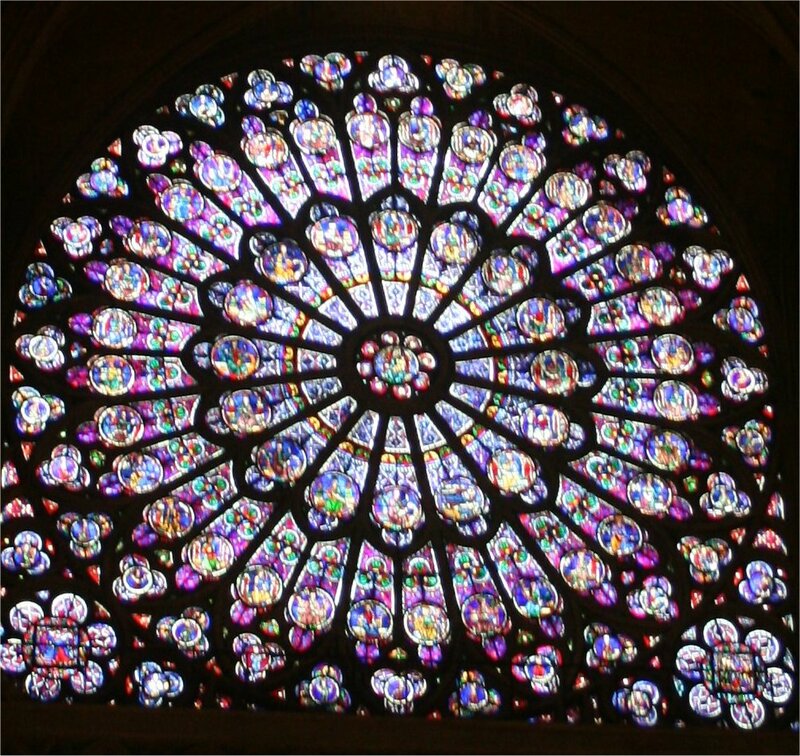 The different parts of the rose window are geometrically connected, and the whole is connected to the focal point at the center. My research indicates that French Cathars and others who fled the Inquisition tried to keep this ancient knowledge alive by practising it in secret. According to Bayley, a number of the refugees were printers and they introduced printing into places like England and Scotland. To keep their religion alive, they embedded the symbols of their religion in the form of watermarks in the documents they printed. Many of these symbols were the same symbols used by the Dogon. This Sun wheel appeared in the watermarks of the Cathars and was recorded by Harold Bayley in his book the Lost Language of Symbolism. 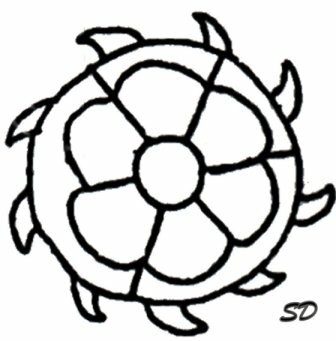 This image shows a connection between the Sun and the symbol of the rose. A red giant star was identified with the sacred feminine by the Dogon and was considered a pregnant Sun because it gave birth to new Suns and planets. When a large Sun reaches the end of its life it becomes a red giant star and explodes as a supernova. The Dogon’s interpretation of cosmology shows that the religion was kept alive by using simple concepts to explain complex subjects. While female red giant stars were pregnant Suns, males stars were dead stars and associated with compact stars like black holes. Pot making was used to explain the different types of compact stars like white dwarfs, neutron stars and black holes. 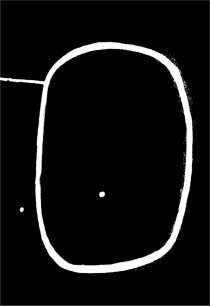 The Smithy, which was also the Celestial Granary, was a black hole, and the Dogon suggested that the Universe formed inside a black hole. Black holes and red giants were hunters. Red giants expanded out into space and searched for their prey, and black holes stayed seated and waited for their prey to come to them. Spinning was used to describe torsion and beer brewing represented the fermentation of the seeds in Amma’s Egg initiating the creation of the Universe.